Finance Malta’s Ivan Grech addressing the guests. 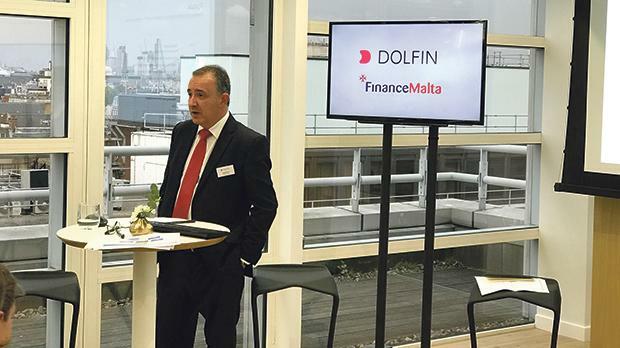 Malta is becoming an increasingly attractive destination for financial services, according to Denis Nagy, CEO of the London-based investment firm Dolfin, who addressed a recent briefing hosted by Finance Malta and Dolfin at the firm’s offices in London. The event aimed at discussing the potential of Malta as a jurisdiction for fund management in the EU. Mr Grech added that Malta is home to 163 investment services licensees, 663 investment funds, 26 fund administrators and eight custodians. He added: “Dolfin’s goal is to become the only London-based operation to offer depository ser­vices in Malta from early 2018. Finance Malta is a non-profit public-private initiative that was set up to promote Malta as an international business and financial centre within, as well as outside of, Malta. It brings together and harnesses the resources of the financial services industry and the government to ensure that Malta maintains a modern and effective legal, regulatory and fiscal framework in which the financial ser­vices sector can continue to grow and prosper.